G. Watts Humphrey Jr.’s multiple Grade II-winning homebred mare Frivolous was entered Sunday to defend her title against a dozen fillies and mares in Thursday’s 100th running of the $200,000 Falls City Handicap Presented by TwinSpires.com (GII) at Churchill Downs, but the 5-year-old daughter of Empire Maker’s participation remains in flux. Humphrey and his daughter, trainer Vicki Oliver, also intend to enter Frivolous, a three-time stakes winner at Churchill Downs, for a showdown against males in Friday’s $500,000 Clark Handicap Presented by Norton Healthcare (Grade I). Entries for the Clark will be taken Tuesday. The 1 1/8-mile Falls City is the traditional main dish on the Thanksgiving Day menu at Churchill Downs – a Louisville tradition since 1969 where more than 7,000 turkey dinners are served with all the trimmings, making it the largest number anywhere in the region. Joining the Falls City on the special 12-race holiday card is the $100,000 River City Handicap (GIII), a 1 1/8-mile test for older horses over the Matt Winn Turf Course. The first race begins early at 11:30 a.m. (all times Eastern) with the River City set as Race 10 at 3:53 p.m. and the Falls City as Race 11 at 4:22 p.m. The final race of the day is scheduled for 4:50 p.m. ET. Frivolous, who finished fifth in last month’s Breeders’ Cup Distaff (GI), is a winner of five races and $750,718 from 24 starts and has enjoyed the bulk of her success beneath Churchill Downs’ Twin Spires. The dark bay or brown mare won last year’s Falls City by a half-length over favorite Don’t Tell Sophia at odds of 19-1. This summer, she defeated future Grade I-winner Sheer Drama by 1 ½ lengths at 32-1 in the $200,000 Fleur de Lis Handicap (GII) and returned to take the $100,000 Locust Grove with an eight-length demolition job as the 6-5 favorite. 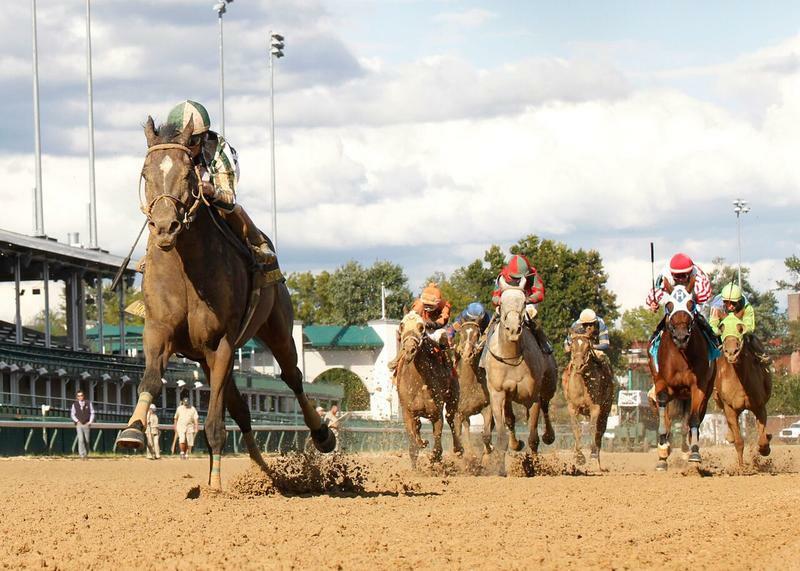 Overall, she boasts a record of 7-3-0-2 at Churchill Downs. Frivolous would be the 122-pound high weight in the Falls City, but would carry 115 pounds in the Clark – seven pounds less than likely headlining participants Effinex and Race Day, six pounds less than Dortmund and five pounds less than Keen Ice. Either race will be the final start of Frivolous’ career as she is scheduled to join Humphrey’s Kentucky broodmare band in the near future, and Oliver hopes Frivolous can avenge her five-length defeat to Stopchargingmaria in the Oct. 30 Distaff at Keeneland. Frivolous landed post No. 5 for the Falls City under regular rider Jon Court and was installed as the 3-1 favorite on Churchill Downs odds maker Mike Battaglia’s morning line. Should Frivolous target the Clark, Forum Racing IV’s 3-year-old Birdatthewire, winner of the Forward Gal (GII) and Gulfstream Park Oaks (GII) earlier this year, would be the 118-pound starting Falls City high weight. 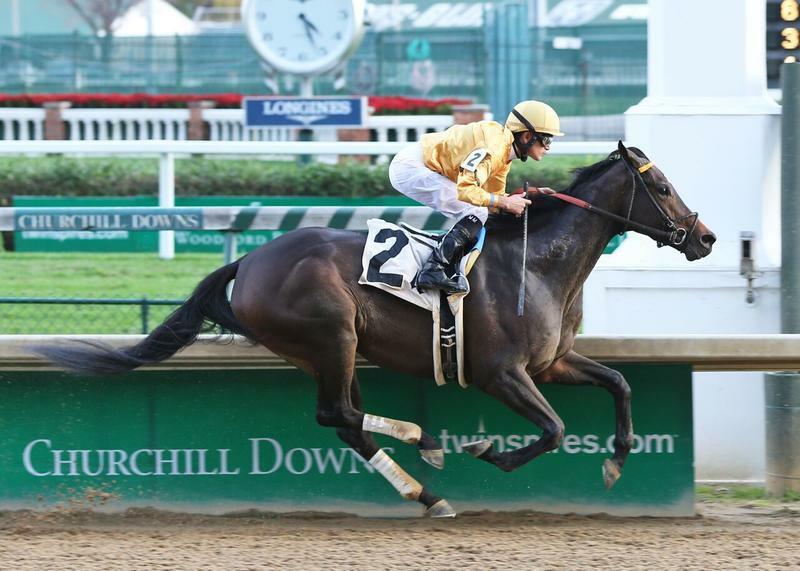 The two-time Grade II-winner, one of five 3-year-old fillies entered in the Falls City, hopes to move forward off a fifth-place finish, 8 ½ lengths back of romping winner Spelling Again, in the $200,000 Chilukki (GII) over a one-turn mile at Churchill Downs on Nov. 7. It was the daughter of Summer Bird’s first race against elders and her first start in 190 days after finishing fifth in the $1 million Longines Kentucky Oaks (GI) when she was 5 ¼ lengths back of winner Lovely Maria. Birdatthewire (9-3-2-1—$379,400) broke a step slow in the Chilukki and then pulled herself into contention between horses before lacking the needed late response to challenge the winner. Birdatthewire is scheduled to break from post No. 9 and is the 4-1 second choice on the morning line. The complete Falls City Handicap field from the rail out (with jockey, weight and morning line odds): Summer Colony runner-up Tiz So Sweet (John Velazquez, 115 pounds, 5-1); Groupie Doll (GIII) winner and Turn Back the Alarm Handicap (GIII) third Call Pat (Joe Rocco Jr., 116, 6-1); Peru-import and Breeders’ Cup Distaff trailer Salama (Chris Landeros, 113, 30-1); 15-time Ohio-bred stakes winner Needmore Flattery (Luis Colon, 116, 50-1); Frivolous (Court, 122, 3-1); Chilukki runner-up Ahh Chocolate (Brian Hernandez Jr., 114, 12-1); 2014 Golden Rod (GII) runner-up No Fault of Mine (Robby Albarado, 112, 12-1); recent first-level allowance winner Gamblers Rose (Shaun Bridgmohan, 112, 30-1); Birdatthewire (Lanerie, 118, 4-1); New York-based three-time stakes winner Montana Native (Channing Hill, 114, 12-1); Woodbine’s Belle Mahone winner Theogony (Julien Leparoux, 117, 12-1); Dogwood (GIII) runner-up and recent four-length second-level allowance winner Chide (Miguel Mena, 116, 5-1); and 2014 Ta Wee third Pretty Fancy (Sophie Doyle, 114, 30-1).